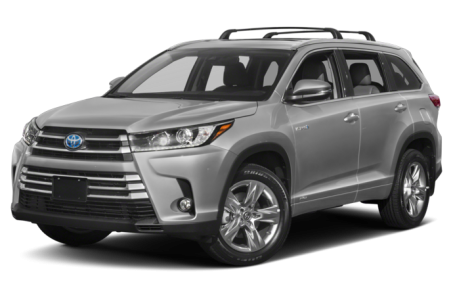 The 2019 Toyota Highlander Hybrid is the more fuel-efficient version of the regular Highlander mid-size SUV. It seats up to eight passengers across three rows. Maximum cargo capacity is 83.7 cubic feet with the rear seats folded down. Three trims are available: Hybrid LE, Hybrid XLE, and Hybrid Limited. It is powered by a combined 306-hp, 3.5-liter V-6 engine and an electric motor mated to a continuously variable automatic transmission.